Lambeth Council has agreed a further five years of trading at The Deck at the National Theatre. Originally granted planning permission for five years, the council has now extended the terms of business for The Deck, allowing it to continue operating until March 2017. 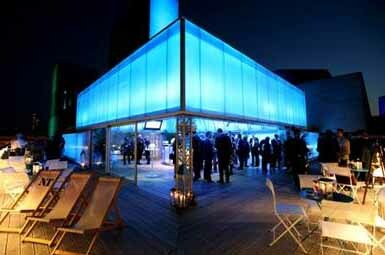 The Deck – a 200sqm glowing box structure – hosted Amex attendees for hospitality in August, and has also welcomed events for companies including ITV and Sainsbury’s. The Deck’s head of sales and hospitality events Kat Parker said: "The Deck may only be a small structural addition to the National Theatre at 200sqms, but it has made a massive financial contribution to our business model. "The Deck’s performance within the first five years of trading has dramatically outstripped initial predictions, and the National Theatre’s corporate entertaining commitment has gone from strength to strength. "The extension of The Deck’s planning permission for another five years will give us the opportunity to further develop the venue side of the business and capitalise on event organisers’ interest in using and being associated with such an iconic brand as the National Theatre." Constructed from tubular steel and clad with diaphanous polycarbonate panels, lit by LEDs, The Deck was originally fabricated off-site and assembled using hydraulic lifts and the National Theatre set building team.